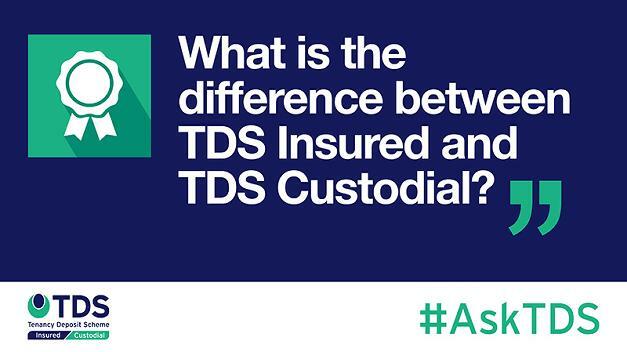 In this week's #AskTDS, we answer the question "what is the difference between TDS Insured and TDS Custodial?" TDS offers membership routes to suit everyone whether you’re a landlord, letting agent, property investor or local authority. We recognise that those in the lettings industry may want different things from their deposit protection scheme and at TDS we offer deposit protection under one roof with both Insured and Custodial offerings. Once you’ve decided that TDS is the scheme for you, the only decision is who holds the money? TDS Custodial is an offering which was launched on 1st April 2016 where TDS holds the deposit money throughout the duration of the tenancy. This scheme is completely free for everyone and there are no membership requirements such as regulatory body status. You can join the scheme instantly online and commence lodging deposits with us straight away. When tenancies come to an end, simply log in to your TDS Custodial database to tell us how a deposit should be repaid. We then communicate with the tenant(s) and once an agreement is reached, we repay the deposit. Our service was tailor-made utilising feedback we received from users of the previously available Custodial scheme. This valuable market research allowed us to develop game-changing features of Custodial deposit protection, streamlining the process and saving members time and money. The key features include a simple tenant changeover function, the ability to change a lead tenant and a time saving prepopulated Prescribed Information document to name just a few. For agent members, we also offer the option to add multiple users to your account and set different permissions for each individual. It’s not just our TDS Custodial members who benefit from the online dispute portal; the TDS Insured scheme also utilises the same useful portal to help make disputes simpler, as well as being the only scheme that allows all three parties to raise and respond to a dispute. Under the Insured scheme, the agent or landlord holds the deposit money and pays us a premium to protect the deposit. The price you pay per tenancy can depend on a range of things from regulatory body membership to rewards for members with low dispute referrals; you could pay as little as £4.10 per tenancy. We also understand that our members have individual needs when it comes to payment and offer flexibility with subscriptions and invoices. With TDS Insured, you discuss the return of the deposit directly with the tenant(s) and reach a resolution as to how the deposit should be repaid. You then release the deposit directly without involving TDS. If the parties can’t agree, you can still utilise the free online dispute resolution service. The TDS system works with a range of third-party software providers such as CFP allowing time saving data imports of all your tenancy deposit data. It also gives members access to a range of different data exports for reconciliation purposes. Whether you’re just starting to take deposits, already using us for some but not all of your tenancy deposits or looking to switch from your existing provider in full – don’t hesitate to contact our Business Development team today on switch@tenancydepositscheme.com or call us on 0300 037 1000.